I couldn’t tell you what radio type that the tanks were equipped with for certain. And I was never a tanker myself. But I did serve in mech infantry tracks, and for a portion of that time as a platoon leader’s driver. In that case, the basic tracks were equipped with a single radio mount, kept on the platoon net freq. The platoon leaders track was equipped with two, one to be kept on the platoon net freq, and one on the company net freq. The company CO track IIRC, would also have two radios, one at the company freq, and one to communicate with battalion. And of course there are also designated Command radio vehicles that may have more radios mounted. Let’s say an operations vehicle with four radios- one on battalion command net, plus each of the company nets. But there is going to be some sort of vehicle linking the different net types. Going back to my LRS time, because we used both HF and FM nets, our commo vehicles carried both radio types in the shelters. I’m sure that practice had to start somewhere, sometime, based upon the need. Stik, I believe you found the answer. Richs26 discovered the 149th Armored Signal Company was a special company within the 9th Armored Division. They had to be able to communicate with the division commander, or at least the battalion commander and also the individual command tanks, or maybe individual tanks in each company. I believe this would require both an AM and FM radio in the Singal Company Jeep. The reason I believe is when a command tank was knocked out there would be no way to communicate beyond the company level and range of FM radio was limited. A signal company was task with replacing radio equipment during operations or repairing the equipment in the field. That was my job in the Army, I had to keep the net functioning at the battalion level and some times made field repairs by replacing individual modules within company radios to keep them working. During the Vietnam War era the U.S. Army used Collins Radio equipment and it was built for fast repair. Every radio was constructed in modular form, so if you knew what to look for a set could be repaired in the field by replacing a damaged module. Today we call that ‘plug-n-play’. Check the engineer jeep in the photos. Richs26, thank you for taking time to research this... I agree, the examples you mentioned fits my applicatin. So, the bumper code on my Jeep will look like this: 9Δ - X on the left side of the front bumper and 149S - 10 on the right side with a 4” Star in the middle of the bumper. The back bumperettes will have 9Δ on first row with X on the second row of the left side. The right side bumperette will have 149S on the first row and 10 on the second row. No Star will be used on the back of the Jeep since the gas can covers that location. Same with the left side quarter panel, no Star will be used since the antenna bracket covers the location. Update: Change of plan, the correct letter size for bumper codes is too large for the bumperettes. So according to AR850-5 no bumper codes will be used in the back of Jeep, only on the front bumper. This is my understanding of the regulations. Plus I may still want to add a rack to the back which could obscure any bumper codes. 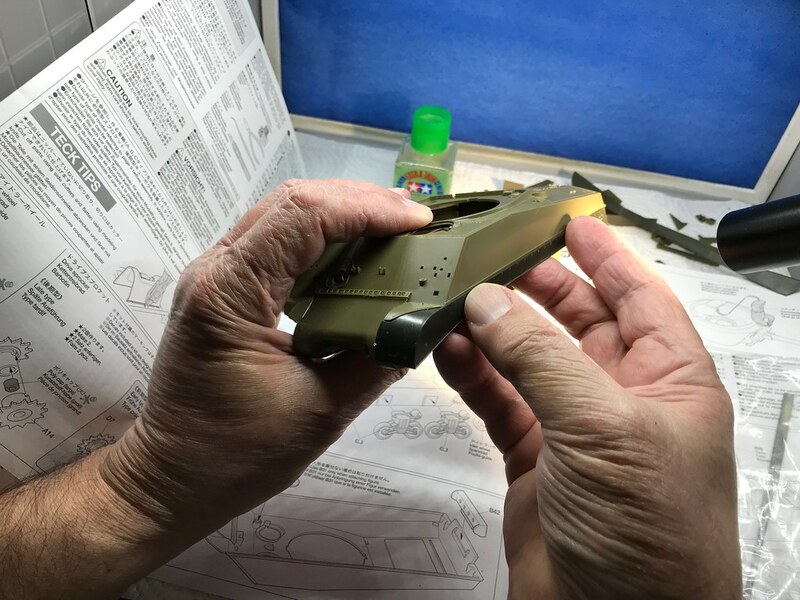 Hey Sergeant, I know this thread is way beyond this point; sorry about that, but I was very happy with the Tamiya XF-62 Olive Drab. Hey Sarge, some units still used bumper codes on the rear bumpers as well. Thats good, you did a nice job on your model. 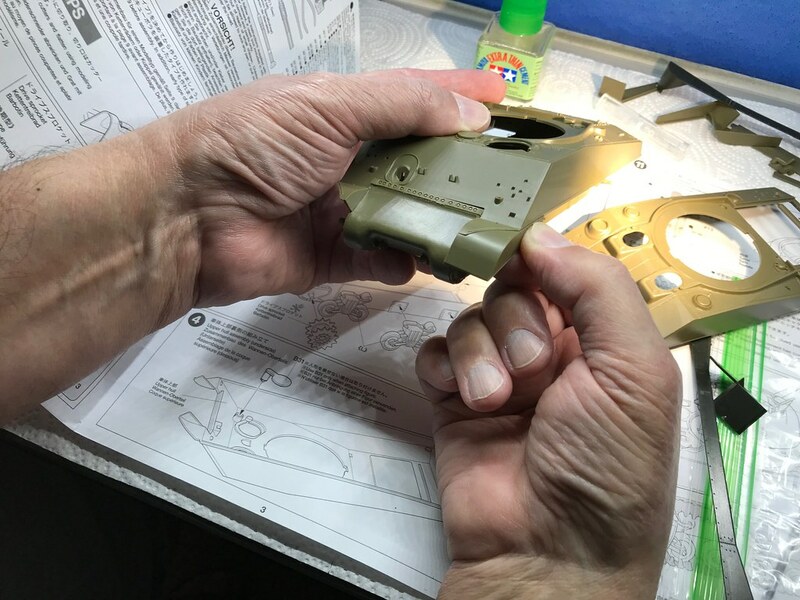 I learned an important lesson while working through the question of olive drab color. There are too many variables even with accurate color samples. The color we see on the screen of our computers can be affected by many different things, like the graphics card, color settings and room lighting. Then we add camera filters and periodic changes paint manufactures make, plus our mixing of paint, color of primer and airbrushing method (modulation). When we’re done what do we compare our work too, an artist colorized black and white photograph, illustration or another model because there are few World War items to compare with and most have faded over the last 75 to 100 years, or been repainted. In the end we do our best and call it olive drab because in practice ever military vehicle after it had been in the field was a little different shade of olive drab. I noticed where you‘re from... I had relatives in Lititz not far from Harrisburg. Hello Stik, I ran into a little problem with bumper codes on the back of my Jeep. Below is the bumper code for the 9th Armored Division, 149th Signal Company on the front bumper. As you can see this will not fit on the bumperettes in the back unless I have smaller lettering, which I don’t have at this time. According to Army regulations AR 850-5 the bumper codes must be shown unless the space is covered with equipment or there is not enough room at the designated location. But under no circumstances can the bumper code be abbreviated or shortened. So if I understand the regulation I can either use smaller lettering or not show the bumper code on the back. You may also be able to tell the bumper in my photograph above is painted with Gloss Varnish; tomorrow I will give it a coat of Matt Varnish to seal the water-slide decals and hide the gloss finish. I had to attach the Archer Fine Transfer decals to Experts-Choice decal paper and apply them as water-slide decals. I could not get the Archer decals to look right by applying them directly to the painted surface. No problem with the Archer product, just operator malfunction. At 73 my eyesight and coordination are starting to fail my ambition for mastering new skills. Just my opinion, but this discussion about OD shades is why to a great degree I don't sweat the exact shade. Between dust, dirt, mud, water, scratches and rust just about any shade or combinations of shades could be correct. When it comes to Sherman variants, it's almost the same thing. 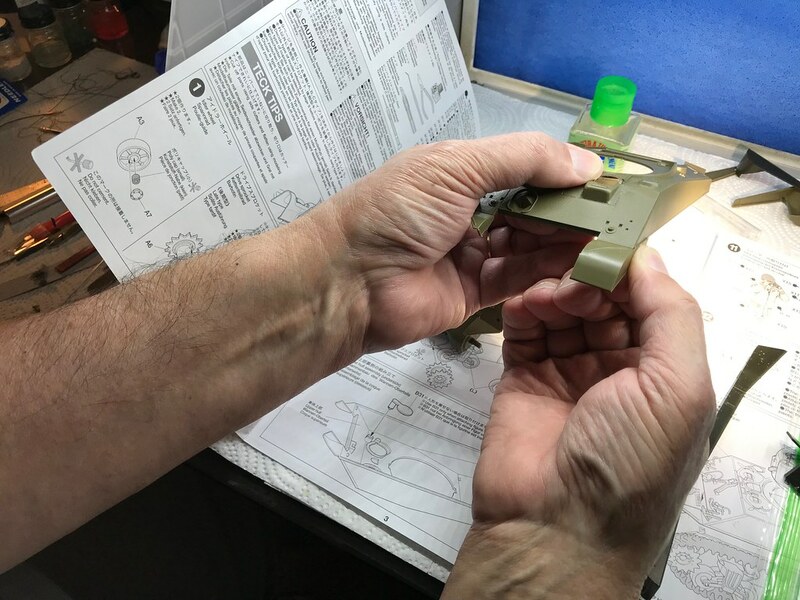 Accounting for different models, factory and field mods, repairs, individual unit tastes and crew modifications almost any combination of equipment could have existed. BTW, the jeep looks terrific! M1GarandFan, thank you for the compliment. I wanted the paint to be as close as possible to factory O. D. before I weatherize it with mud, dirt and snow. 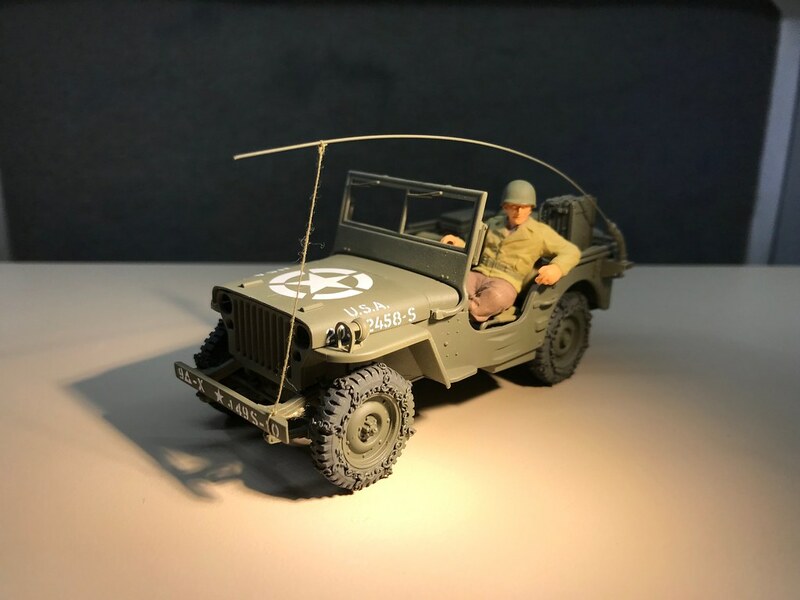 The goal is to use this Jeep and a Sherman M4A3 in a diorama representing 9th Armored Division in Belgium on 19 December 1944. I agree with your statement about olive drab color... To see it any other way is an exercise in futility. Sergeant, Considering how much effort you've put into this so far, I'm sure the diorama will look great and I really love the diorama's concept. As is so often the case with the armor modelers, I'm a huge wwii history buff, with the Bulge being one of my favorite subjects. I've been fortunate to be able to visit the area twice. Sitting on a shelf in my office is the barrel and receiver of an M1 I picked up in a forest in the Schnee Eifel in 1973. Looking forward to the finished dio! Painting and decals finished all that remains is minor assembly of window glass, rearview mirror, steering wheel, tools and stowage then I can put this model aside and concentrate on the Sherman. I think there is a tooling problem, or maybe it's me? 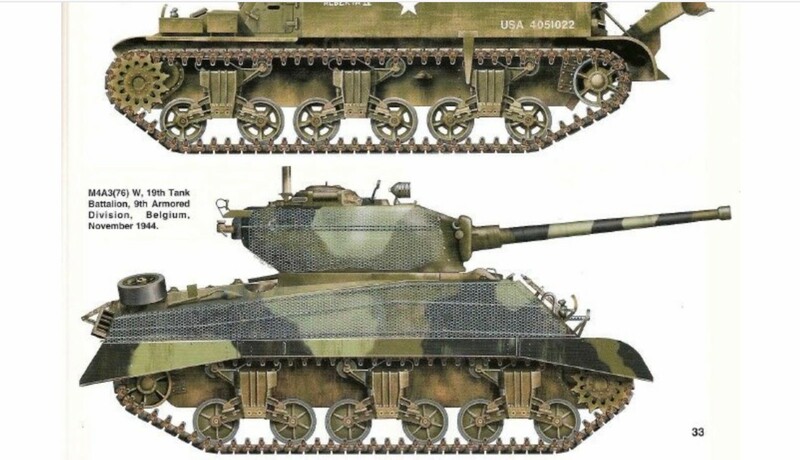 The photograph above is the Sherman I'm trying to represent with my Tamiya M4A3 kit #35250. If you notice the tank has one fender missing. Be that as it may all the pictures, I've seen of the 9th Armored Division Sherman's in the Battle of the Bulge had these fenders and dust-shields installed. 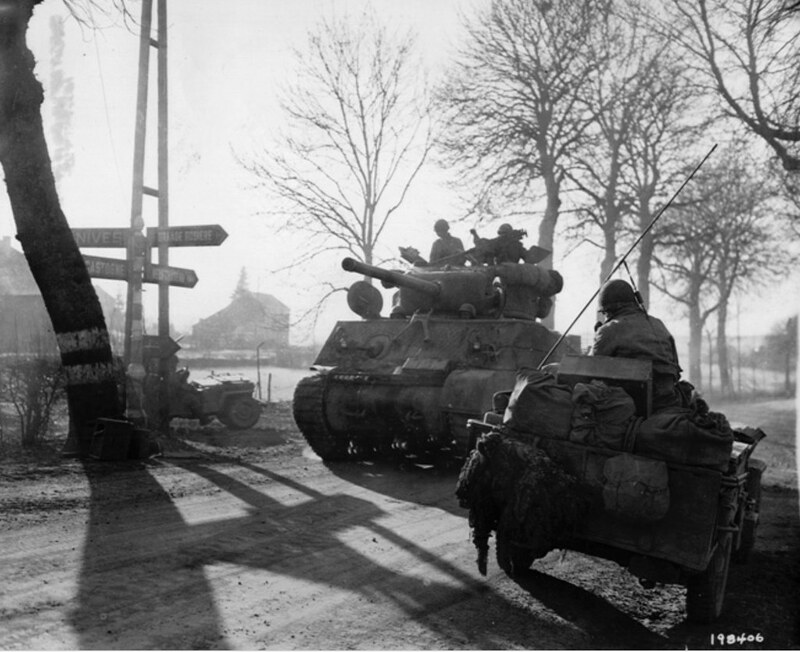 However, when the 9th Armored Division arrives in Germany in 1945 the fenders and dust-shields are removed in most of the pictures. I mention this fact for reference only. Above is the fenders and dust-shields Stik gave me from another kit. They are the right length and seem to fit until you look straight on at the upper hull with the fender in place. When the inside of the fender is straight with the transmission housing the curve of the two fenders leave a large gap as shown below. 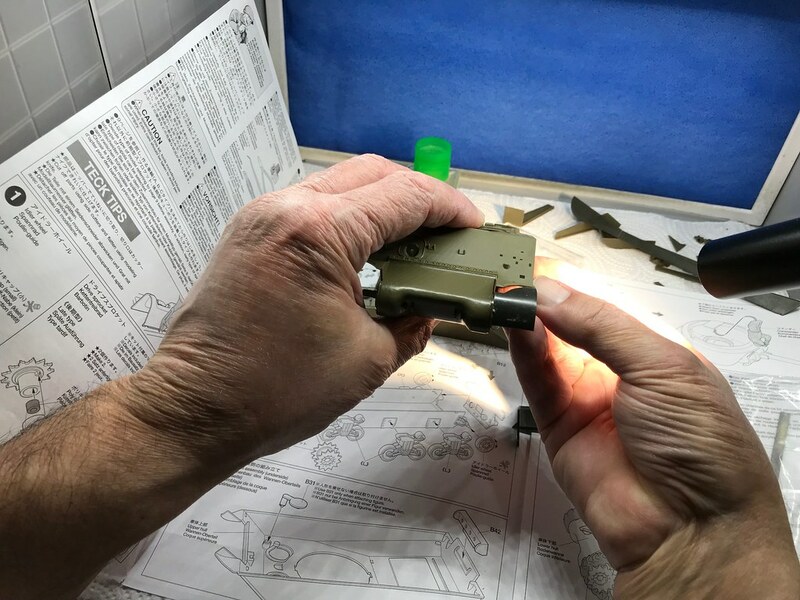 So I purchased a Tamiya M4A3 kit #35190 which had fenders and dust-shields and encountered the same problem as shown below. According to Scalemate's web site these two Tamiya kits came from the same tooling. 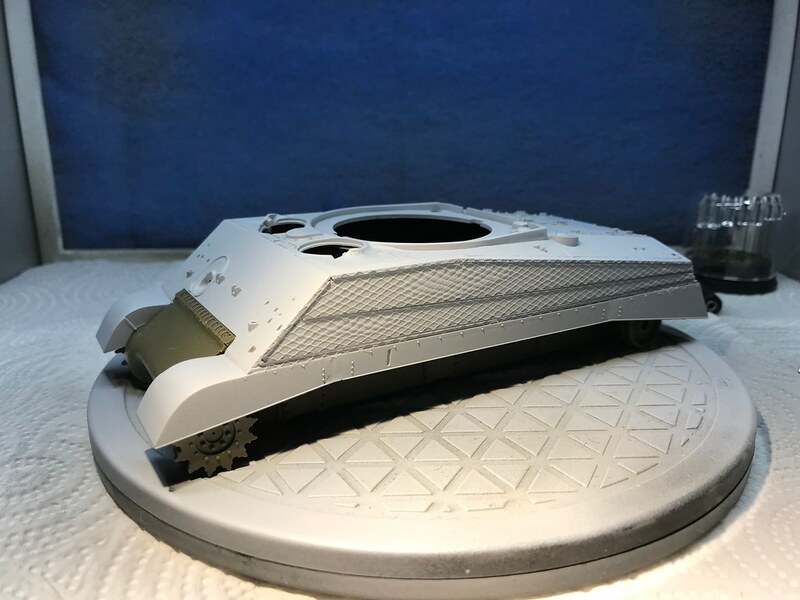 If I didn't mind the fender turning into the transmission housing then I think the Tamiya fenders from kit #35190 might work on kit #35250, but I do mine and they may interfere with the tracks. Please see photograph below. I realized it may be hard to see how much the fender turns into the transmission housing in this photograph, so I measured it and the offset is a 1/16". 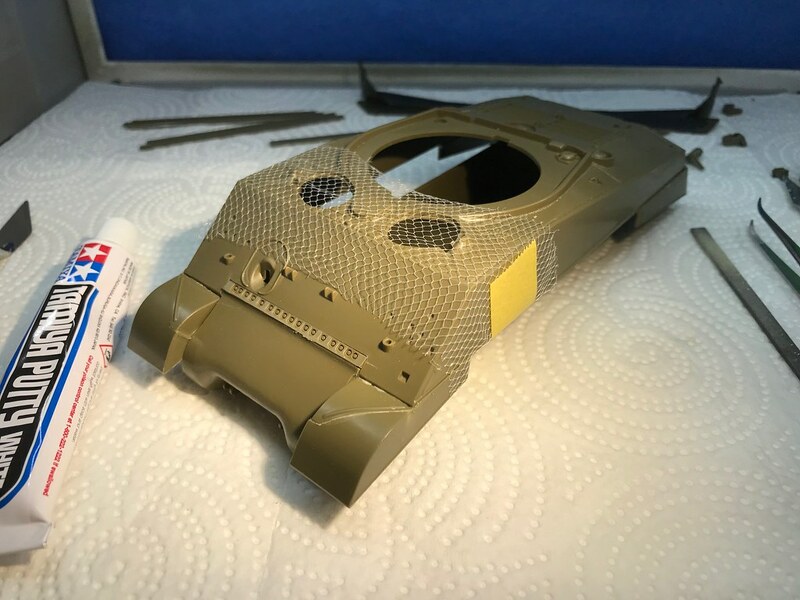 Next, I compared the fit of fenders and dust-shields that came with Tamiya kit #35190 and they appear to my eyes to be the way you would expect them too. 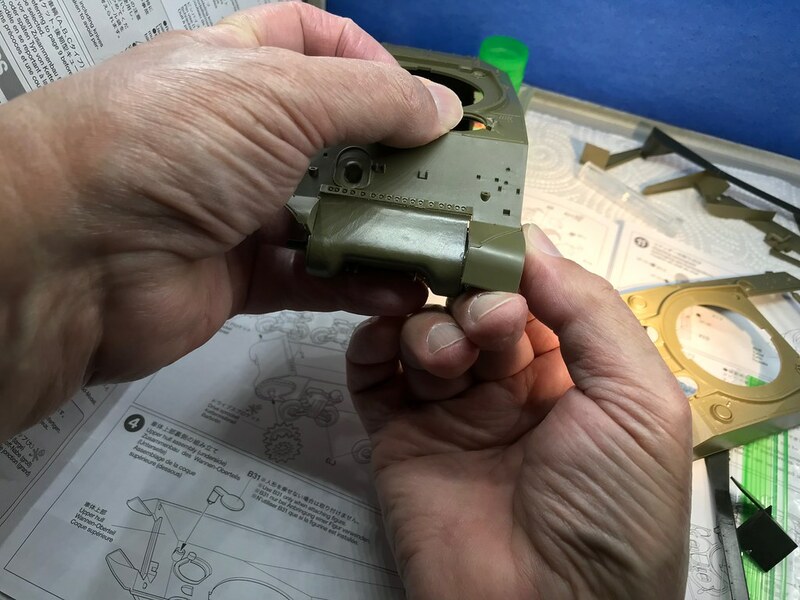 So, I believe Tamiya may have made a sight change in their tooling for kit #35250 which according to Scalemate was released later and did not have fenders and dust-shields in the kit. The question is do I change the Sherman in my diorama to kit #35190 which is the wrong tank (57 degree glacis instead of 47 degree), or leave the fenders and dust-shields off and use kit #35250 even though I know they were used during the Battle of the Bulge? All I can say is go with the later large hatch hull. Some sheet styrene can be used for the gaps and alignment problems on fit. But you will not see a 76mm T23 turret on a small hatch hull. The hull hatches interfered withnthe travese of the turret. Sergeant, I agree with stik on this question. I'm a little stunned that the fit of those fenders is so bad on that Tamiya kit; they usually do much better. 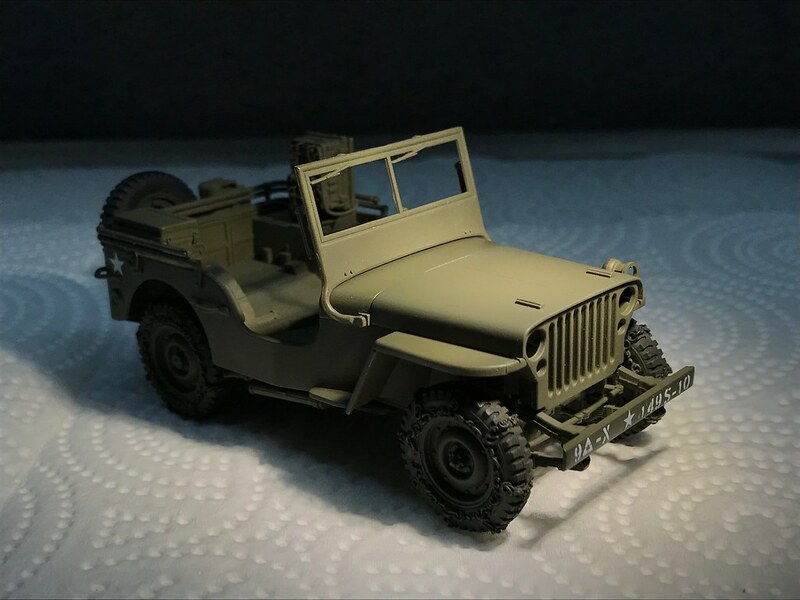 I can see by the old photo that the fender is missing on the right front of that M4A3 and the left side is obscured by the jeep except for the front fender. 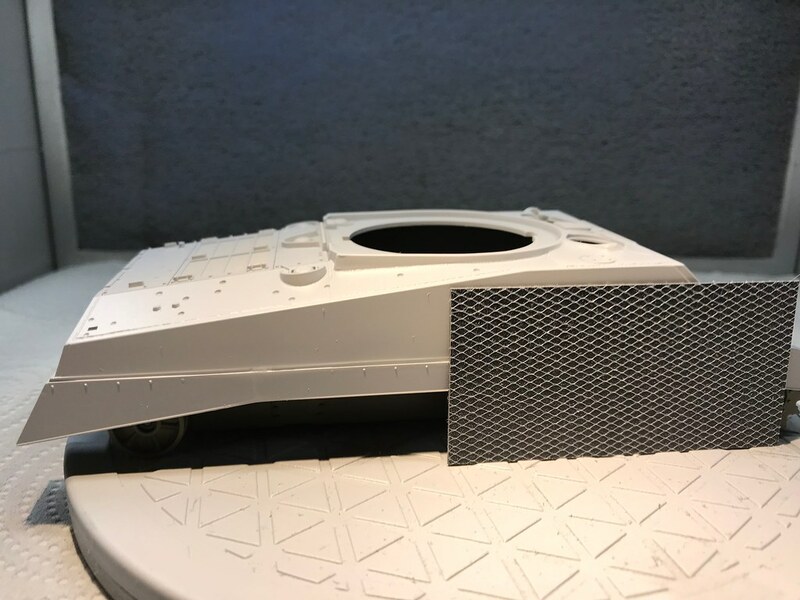 There is a chance that the piece still on the left front is the ONLY piece of the sand shields still attached as most units removed the shields entirely to ease track and bogie maintenance. I would consider not using the fenders at all. The next tank behind the one in the photo may not have any sand shields at all. Just a thought. 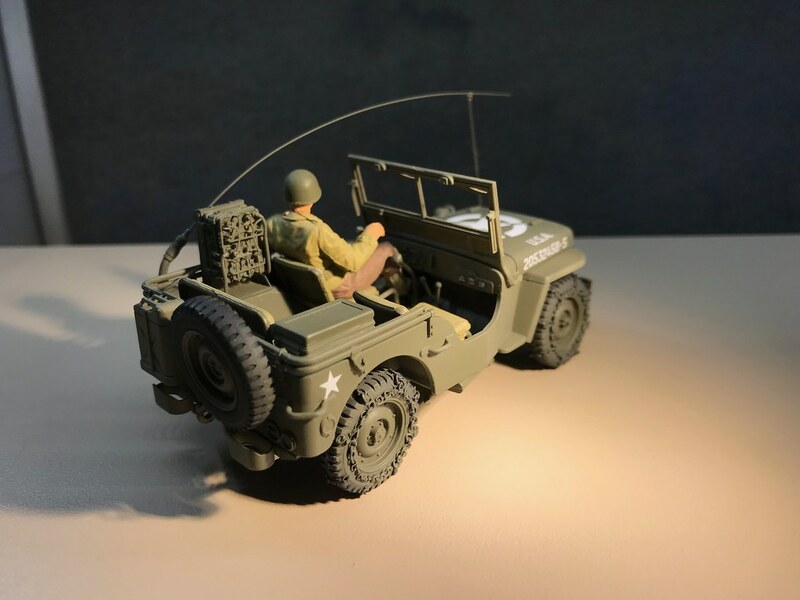 Love the jeep w/radio and the figure! Stikpusher, M1GarandFan and TigerII, thank you for the ideas and encouragement. I found a way to make the fenders and dust-shields work. First, I removed the small fenders from the upper hull in kit #35250 below. Then I removed the small fenders from the upper hull of the other kit #35190 and glued them on kit #35250. Using Stik's idea I shimmed the fenders until they were straight with the transmission housing, you can see just a little polystyrene shim stock in the photograph below. In each kit there is a board (not shown) attached to the inside of both right and left fenders that sits on the transmission housing. It will be installed later. 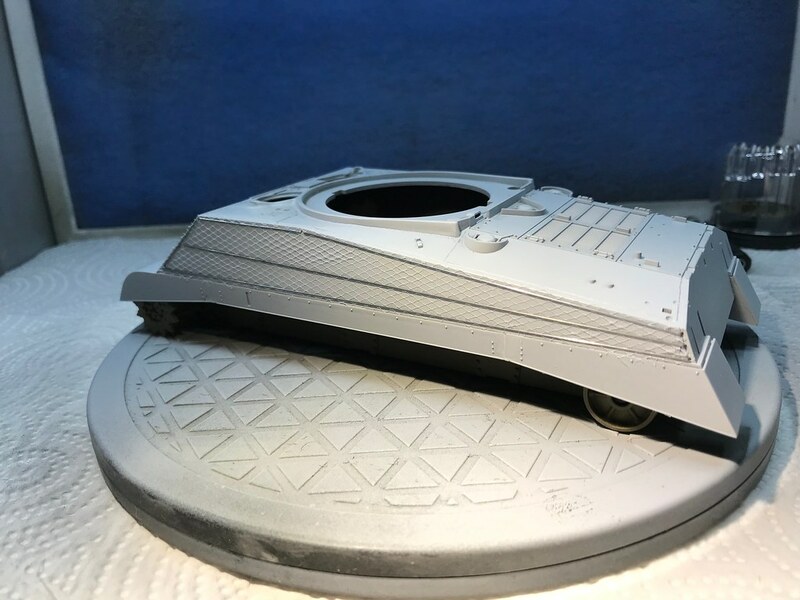 I also attached the back fenders, so the only thing left on this step is the center dust-shields, some putty, a little sanding. 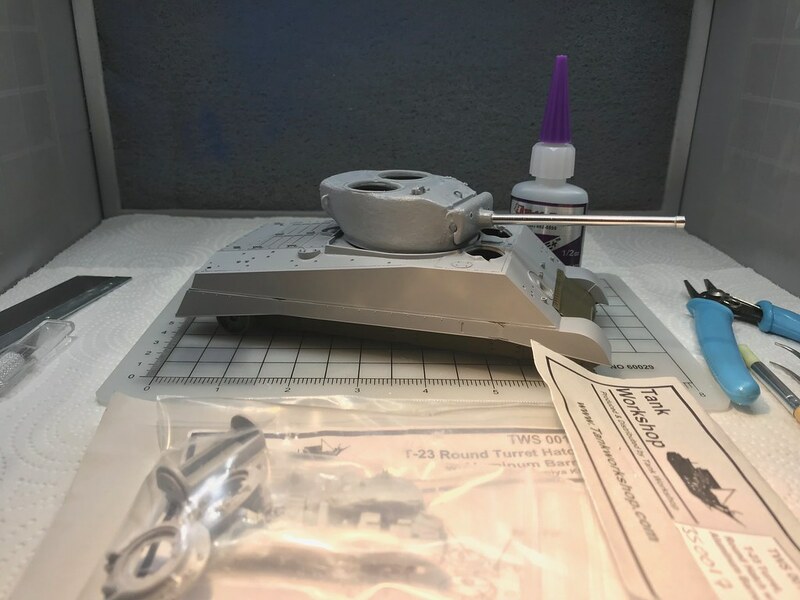 Then I need to wait for the Tank Workshop T-23 turret to arrive. I found some Tulle material at a craft store I think will be perfect to represent Somerfeld matting in 1/35 scale; however, it's made of 100% polyester and I'm not sure how this material will react to glue, or primer. Sergeant, It looks like that worked out well for you. The fenders look very good. I can't remember exactly, but I think I used super glue on the tule I used on my M5A1 at the rear exhaust. My first attempt at representing Summerfeld Matting using .015" music wire and polyester tulle. The music wire is attached to the upper hull by drilling .018" holes and creating a 90-degree bend in the end of the wire. Thank you M1GarandFan, I was surprised how much work was required to make the fenders and dust-shields look right. I did not glue the tulle down yet, I’m still trying out ideas on how the wire and netting should go together. Stik, I don't really like the method I used above, it doesn't look right to me. The wire is to straight and the matting should be over the wires, not underneath. I would rather use styrene rod as you suggested if I can find some small enough. Above is an example of what I think Summerfeld matting would look like over dark camouflage colors. I believe the matting was galvanized, so its color would have appeared flat grey or pewter. 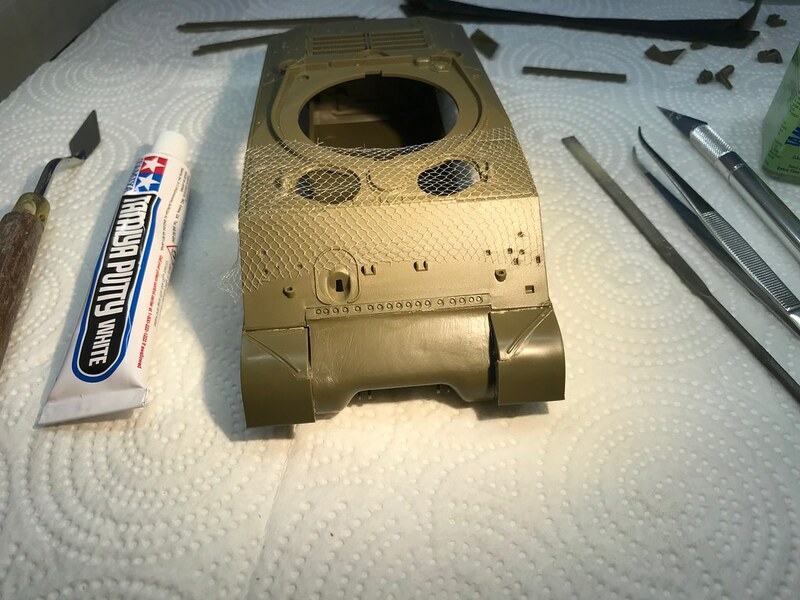 The way I hope to apply this material is after the hull is painted in the camouflage colors of black, olive drab and light green I will mask off a section, apply a clear coat of Matt Varnish and lay the tulle in the wet varnish like the sample in the picture above. When the varnish is dry I can trim off the excess material. The tulle will give the paint underneath a similar appearance to the illustration above. 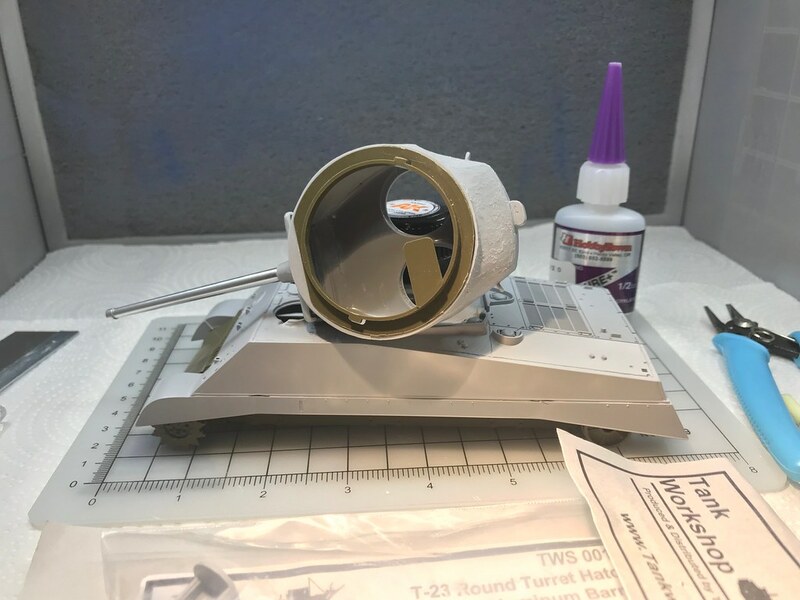 Started assembly of Tank Workshop's T-23 resin turret kit. 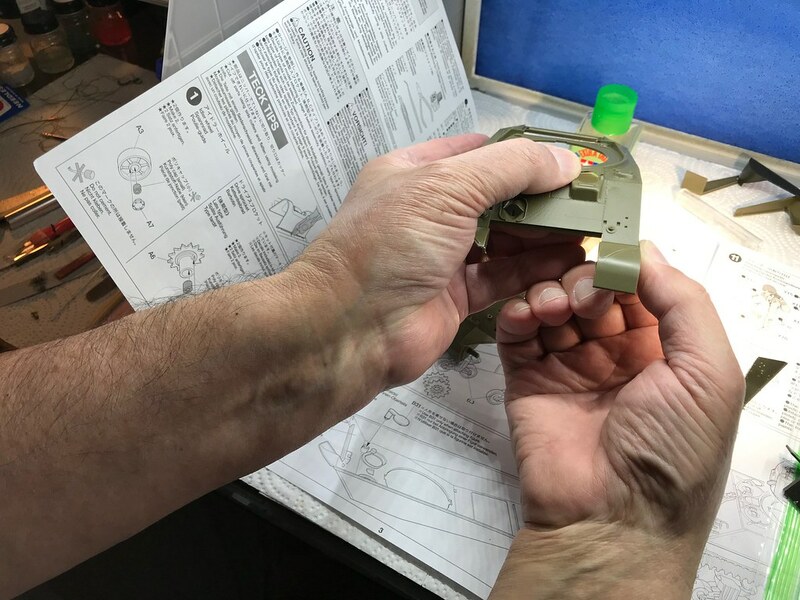 However, the turret ring in this kit was not formed completely, so I modified the Tamiya turret ring and it fits remarkably well after minor adjustments. I still have a lot of work to do but so far there have only been temporary setbacks.